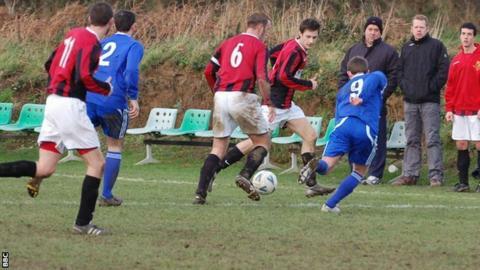 Promotion and relegation could be introduced between the main football leagues in Guernsey. Currently sides in the top-tier Priaulx League, second-tier Jackson League and third-tier Railway League cannot move between the leagues. The idea is part of a review into how the game is run in Guernsey. "We'd like to introduce promotion and relegation, it would add a little bit of extra edge to the game," said league official Geoff Horsepool. Guernsey's best players have not featured in the Priaulx League since Guernsey FC was formed in 2011. Last season's champions North were thrashed 9-0 by Jersey champions St Paul's in a record win in the annual Upton clash between the best club sides in either island. "There's a consensus that something needs to be done to improve football generally and giver better opportunities for players at their own level," added Horsepool, to BBC Radio Guernsey. "The idea has been mooted that we try to consider three divisions or two divisions, but promotion and relegation for the first time. "There has been a suggestion that we might reintroduce an under-21 league, everything us up in the air at the moment."